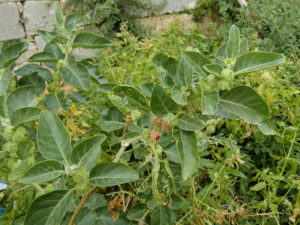 Withania is called “Indian Ginseng” as it is used in Ayurvedic Medicine in much the way that Ginseng is used in Chinese Medicine – to improve vitality and to aid recovery after illness. Alkaloids, steroidal lactones (withanolides), iron. Care must be taken in people with heart insufficiency.